Visual perceptual skills do not operate in isolation. For efficiency, the brain incorporates eye movements with neural pathways that extend to include language, vestibular, and hand function skills. This is one of the primary reasons why many pediatric occupational therapists provide “heavy work” movement activities for children before sitting them down at a table for hand function or visual perceptual tasks. One of our favorite heavy work preparatory activities is physioball walk outs. This preparatory activity incorporates use of either a hop ball (with the handle turned to one side) or a physioball with a large visual target. The child places his/her tummy over the ball, pushes up on both arms, and “walks” on the hands toward a target. A wide variety of physioball activities can be used to intentionally incorporate vision with balance and hand function skills. “medium motor” manipulatives that are easy enough to handle, thus freeing the upper portions of the brain to focus upon combining postural control with functional vision behavior. Combining the antigravity heavy work with slow movement stimulates the nervous system to produce calming neurochemicals. The combination of resistive motor moves, coupled with slow vestibular input supports increased awareness of postural control, and centers the body parts to perform steady holding patterns. These types of activities prepares the back, head, eyes and hands as a unit to engage visual perceptual tasks. Key motor components of visual perception such as visual pursuits (tracking) may be facilitated through use of physioball activities as these tasks place the body parts into a position from which near vision skills emerge in a developmental manner. 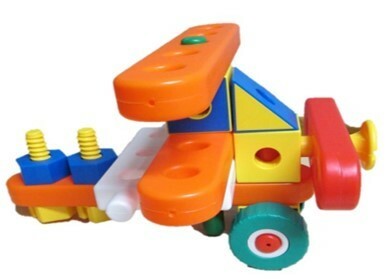 These activities also facilitate expression of motor free language components of visual perceptual skills (such as “What is this?” and “Where does this go?”), thus preparing the child for use of inner language to guide spatial orientation of the parts of the toy. We used a digital tablet with steps of the assembly process broken down and shown in series of slides. Each slide shows 2 – 3 pieces needed for each step, followed by a slide showing what the project looks like when the pieces for the step have been put together. The presentation for each project was designed to enhance visual sequencing and spatial orientation skills. Hand function skills were inherently incorporated into the process of assembly. We used the construction toy “Big Bolt Construction”, for this project. The toy is available from Lakeshore Learning Materials as shown below.